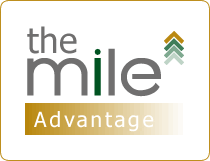 MILE aspires to achieve its vision through building an effective collaborative network; leveraging information technology; offering relevant holistic life-long developmental services; ensuring sustainability and continuous development of intellectual capital; and striving in being a role model in applying the most advanced and ethical management practice. To achieve collaboration, MILE identified its key stakeholders and developed for each one the main features of a win-win relationship. Figure (2) below illustrates MILE key stakeholders. Mile intends to make the best use of web technologies and social networking tools to facilitate dialogue among local executives. MILE has already established its presence on LinkedIn, YouTube, Facebook, Twitter, Flickers, Gmail, Yahoo …etc, to name a few. MILE intends as well to build a state-of-the-art Portal which aims to become the meeting place of our local managers who seek developmental resources and a platform to share and discuss issues of common concern. 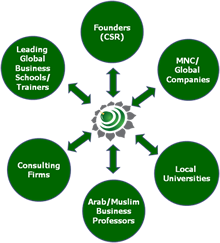 MILE holistic approach to executive education is rooted in the Muslim worldview of human nature. It encompasses the four aspects of the human being; mental, physical, emotional and spiritual. My Strength Mirror: A tool to enable participants to provide positive feedback to each other by highlighting each other's areas of strength. Offering healthy food throughout the program which constitutes more fiber and less cholesterol. MILE believes that its relation with program participants starts the day they graduate. Developing executive capability is a journey not an event. List Below illustrates some of the support tools that MILE intend to employ to provide life-long development support tour executives. MILE aspires to be a role model through employing best management practices and adhering to the highest standards of business ethics.